Redbull gives u WINGS!. 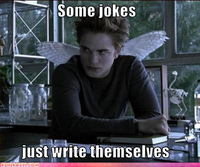 Edward Cullen drank redbull. Images in the Critical Analysis of Twilight club tagged: twilight funny anti critical analysis icon edward cullen vampire cat redbull wings. Robert gets PWNED door Doctor Who!